Server died. Primary Disk connected to another working server. How to P2V this secondary disk? I have had an urgent situation, whereby our server running Windows XP died. We've managed to connect the disk to another working server, by using a caddy which has a USB lead that connects to this server. So now, this disk is being seen by the server as a secondary disk. I ran the Vmware standalone converter, hoping that I could virtualise this primary disk and run it as a VM on this actual working server. But of course, the disk isn't mounted and so Vmware converter can't P2V this disk, so far as I see. Do you guys have any idea how to go about doing this? Using VMware vCenter Converter Standalone! and another product which is capable of providing an image to VMware vCenter Converter Standalone to convert to a VM. 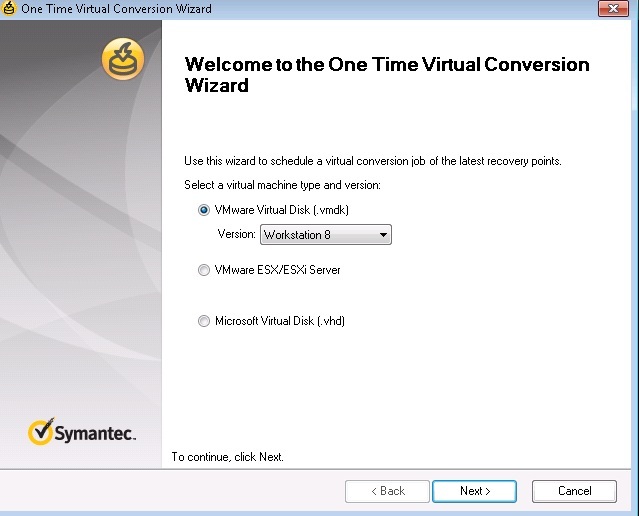 Symantec Backup Exec System Recovery (download a trial) can image the disk, and then present the image to VMware vCenter Converter Standalone! Yes, backup the Windows XP E: drive, and use the resulting image. Acronis and Symantec have options which can convert this directly to a VM, without using VMware vCenter Converter Standalone. Do I use this option (snapshot provided)? Should I use Workstation or Esx/Esxi? Where would you like to virtualise the computer on VMware Workstation or VMware ESX/ESXi ? I guess you just answered my question:). It'll be Vmware Workstation. Can Vmware player not be used at all? Yes, the same version for VMware Workstation can be used on VMware Player. How do I assign you like 5million points?! Ask the Moderators!!!! (I joke, before you go off and hassle them!). Glad it's fixed your issue, I was just working on this very article!